For our new adopters and those of you who don’t keep up with the various greyhound events, one large event is scheduled in our local area that you may want to attend. Greyhounds in Gettysburg is a HUGE event held every year in Gettysburg, Pennsylvania, during the last weekend in April. This year, the event will be held from April 23 through 25. 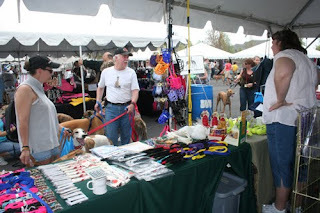 Hundreds of greyhounds and their adopters show up at Gettysburg each year and participate in a number of greyt events. In addition, there are lots and lots of vendors who sell all kinds of greyhound-related items. Triangle Greyhound Society is sponsoring the eleventh annual Greyhounds in Gettysburg. There is lots of free time to explore the battlefield, to get acquainted with new friends and reacquainted with old friends. Everyone should feel free to explore the battlefield and national park on your own schedule at your own pace. Tape guides, tour busses, and national park tour guides are available at reasonable prices. Make sure to take time to explore the Visitor’s Center (no dogs allowed in the building) to find out more about this Historic Landmark. Although you must register to participate in the events, no registration is necessary if you just wish to drive up and visit the vendor tents. For more information on this event, click on the title of this post. For the second year in a row, FFGR, Inc. will be vending at this event! We will have all of our inventory there including a variety of concrete greyhound garden statues. If you would like to help by volunteering your time to work in our tent, please contact us via email.